Their trips followed recent visits from others — Arizona Republican Sen. Jeff Flake and Democrats like Julian Castro, Oregon Sen. Jeff Merkley and Reps. Seth Moulton of Massachusetts and Tim Ryan from Ohio. President Donald Trump and Vice President Mike Pence both dropped by the state last month. With such a wide-open field on the Democratic side and the potential for a primary of a sitting president on the Republican side, many of those on the ground feel like things are buzzing earlier than ever. 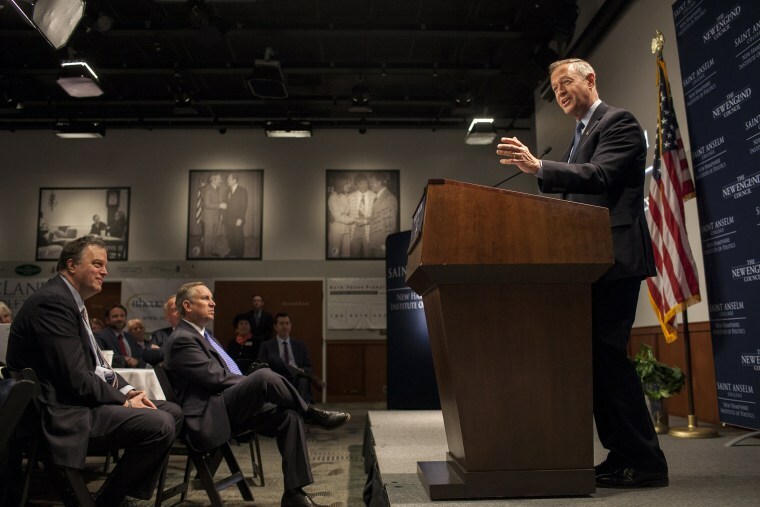 "Here in New Hampshire, the 2020 cycle has already begun," said Wayne Lesperance, the Dean of Undergraduate Programs and political science professor at New England College, in between events with O’Malley and Kasich. Activity is increasing so quickly "because of the absolute craziness that's going on in D.C.," said state Sen. Lou D'Allesandro, a longtime figurehead in the state's Democratic politics. "As a result, things will perk earlier." At this stage, there are the public events — with national politicians unafraid more than a year and a half before the primary season begins to touch down and engage with residents in front of the cameras. But there's also a silent maneuvering of candidates trying to knit together what could eventually turn into a coalition of organization and support. "The day after a November election, there is stuff going on in New Hampshire," said Neil Levesque, the Executive Director of the New Hampshire Institute of Politics. "People are constantly reaching out to activists. There is sort of a low-level campaign always going on, and I think that's the case up until about February of this year when it started heating up." "They pass through and they say hello," said D'Allesandro about some of the possible candidates. "No one admits that they're running. But I think there's a lot of noise and a lot of movement." Former longtime New Hampshire Democratic political aide Judy Reardon pointed out that lawmakers like Merkley (the only sitting senator to endorse Bernie Sanders in 2016) met with people and made phone calls, "but did not put it in the framework of, 'I'm running for president.'" An aide to Merkley acknowledged that, like many of his Senate colleagues, the senator is keeping his options open for 2020, and has met with a number of activists in early-voting states to talk about Democratic politics and voting rights issues, including a meeting with some of Bernie Sanders' top New Hampshire supporters. Levesque added that conversations between potential candidates, their teams and people on the ground in New Hampshire have been ongoing, regardless of whether the politician has necessarily stepped foot in the state just yet. "You have your key activists, most of whom keep secrets," he said. "They're not going to go and tell you that so-and-so has been calling them from another state, but they definitely are." "It is very important at this stage to get some of those key activists and people involved — key lawmakers, people who have constituencies here in the state," he continued. "So when candidates come in this early and they start to do that, it's good for them in the long run." Political operatives and state lawmakers, particularly on the Democratic side, are already surveying their options of whom they might be able to get behind. The first real campaign of New Hampshire is perhaps the competition to woo potential staffers who could eventually sign on to work for a campaign. "There's two groups who are being courted," said Lesperance. "The state legislators, the folks who are influential with voters, and then the operatives." He said this is the time "where you try to convince those leaders in New Hampshire politics, the operatives, to really take a look and come on board your campaign if that's where you're going to go." But if 2016 proved anything, it's that experienced New Hampshire political hands on either side of the aisle can't guarantee success for anyone in the primary. Most of the state's Democratic establishment backed Hillary Clinton in the primary, while the more experienced Republicans here backed a combination of candidates, including Chris Christie, Kasich, Jeb Bush and Marco Rubio. Bernie Sanders and Donald Trump still handily won their respective contests. "2020 is going to be interesting because in 2016, all of the insiders were able to deliver absolutely nothing," acknowledged Jeff Woodburn, New Hampshire’s Democratic state Senate minority leader. "We were so wrong and so ineffective." Like almost all Democrats in the state, Woodburn sees the upcoming contest as "absolutely wide open." New Hampshire Democratic Party Chair Ray Buckley, whose job is to stay neutral in the primaries, acknowledged that he's been speaking to a number of potential Democratic presidential candidates — people who held or currently hold elected office — and said the state party is prepared to help them all. Offering a suggestion he admitted was slightly selfish, Buckley advised any potential Democratic candidate who was thinking about seriously competing in New Hampshire in 2020 to "find their 10 best political operatives and send them to New Hampshire in 2018, to have them get that experience under their belt." Assembling any kind of eventual campaign infrastructure or support might be slightly easier for those potential candidates who already waged a campaign last time around. Democratic Executive Councilor Andru Volinsky, who previously worked as an attorney for the Sanders campaign in New Hampshire, noted that most of those on the Vermont senator's steering committee have been active in state politics "almost nonstop since the primary," even though Sanders himself hasn’t indicated one way or another if he’ll run again. "We have had an impact on the state party," Volinsky said. "That infrastructure continues to exist." In addition to engaging in a slew of local and national media appearances and stopping by signature campaign trail destinations like Manchester's Red Arrow Diner and New England College's President's Speaker Series during his trip this week, Kasich had dinner with some of his former top New Hampshire backers Monday night. One of them, former New Hampshire Attorney General Tom Rath, hosted an informal gathering on Tuesday afternoon for the governor and his aides from Ohio to re-connect with former key campaign supporters and town chairs. Kasich was clear that he hasn't decided what he'll do after he leaves office in January 2019, but said he wants to keep his options open. He hasn't ruled out a challenge to Trump from within the Republican Party or by waging an independent bid, though his aides acknowledge the tremendous potential legal and logistical difficulties something like that would entail. "I don't know what I'm going to do, I know it's hard to believe," Kasich said Tuesday night. "I do have a political operation I want to keep alive, and all I can say is I don't want to take any options off because I don't know what's going to happen. I’m not in some deep planning mode of this or that or this strategy or that tactic." Since winning the 2016 primary, Trump finds allies in every corner of the Republican apparatus in New Hampshire, from the state party to the state legislature to the state's GOP base. "There's no giant piece of the power structure that's saying 'no'" to the president, Rath noted. "On the other hand, the power structure doesn't mean much anymore." One former top Republican official, ex-New Hampshire Republican Party Chairwoman Jennifer Horn, thinks their side of the 2020 primary might not be so quiet. "I think that there will definitely be a Republican primary in 2020," she told NBC News after attending Kasich's event. "How credible it is, how significant it is, I think that's still going to unfold. It really depends on who takes it seriously."